The green, orange and red chat bubbles in Gmail signal if your contacts are online, idle or unavailable, but as more people sign in from mobile devices, it's becoming harder to tell when someone is actually online at a computer or just connected with their phone. The Green Robot feature in Gmail Labs helps you spot when you might want to tailor your exchanges with more succinct messages for people who are signed in with Android-powered devices. Look for the green beaker icon at the top of Gmail to enable Green Robot and other Labs features. 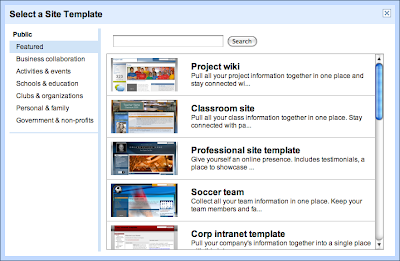 On Tuesday we launched templates for Google Sites. The templates gallery is filled with useful example sites ranging from wedding websites to corporate intranets, which you can copy and customize so they're just right. This lets you create a useful, visually appealing collaborative workspace in seconds. And if you have a great site other people would find useful, you can submit it to the gallery. 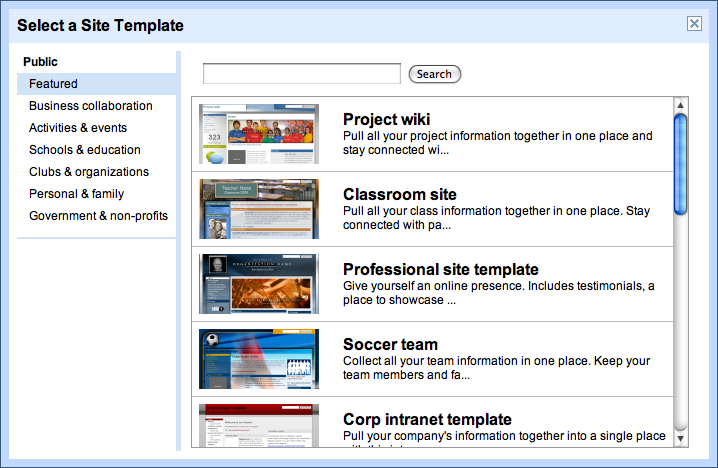 If your business uses Google Sites, templates you submit stay private within your company. If you're using Google Apps to store photos and manage large volumes of personal email, you'll be happy to hear we're now offering more extra storage for less. 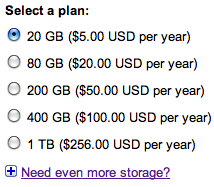 Our new overflow storage plans start at $5 per year for 20 GB. For the most avid shutterbugs, the 16 TB plan is enough space for roughly 8 million high resolution pictures! Last week, we released an update to Google Apps Sync for Microsoft Outlook, our tool that lets companies stop running Microsoft Exchange while still letting some employees use the familiar Outlook interface. Now, employees can sync multiple calendars between Outlook and Google Apps, and look up free/busy information from Exchange for co-workers who haven't migrated to Google Apps yet. Businesses using Google Apps not only save money compared to running their own email systems, but also their employees get access to innovation at a much faster pace than with conventional business technologies. We've launched over 100 improvements to Google Apps in the last year, and on Thursday I hosted a webcast to recap noteworthy recent updates for businesses, including push email, contacts and calendar support for BlackBerry, iPhone, Windows Mobile and Android, Sync for Microsoft Outlook, offline access and more. If you missed the webcast, you can watch it on YouTube.